Ladies and gentlemen, get your swords. 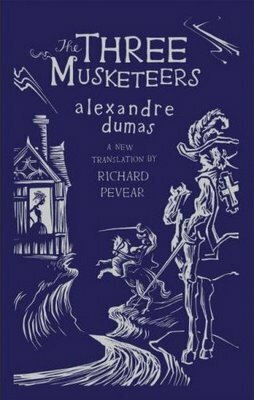 On top is the UK version of this new translation. On the bottom is the US version. I expect a good duel over this one...which do you like better? The UK version looks less contemporary; the American version (cover illustration by Barry Blitt?) is colorful, funny, and appealing, and I think it might even draw in readers who wouldn't otherwise consider picking up this book. Hmm, the UK version seems to evoke Don Quixote for me, maybe because of the composition and the face that only 2 guys are shown. The US one is interesting, but not that attractive to me. Sorry to spoil the soup, but I don't like either. Booth look way too much like kid's books and it's a shame that the Three Musketeers usually end up there. Since this is a new - and I hope complete - translation that's all the worse. Still, both are very fresh designs. I like the execution of the UK one better but the US one fits the material. I vote for the American version. Its British approach to the art actually detracts in this instance. The American version is more colourful and clearer in intent. They both look like kids' books though. American version, by far. The British one reminds me, too, of Don Quixote. Neither, to be honest. Both books firmly plant this classic as children's literature. 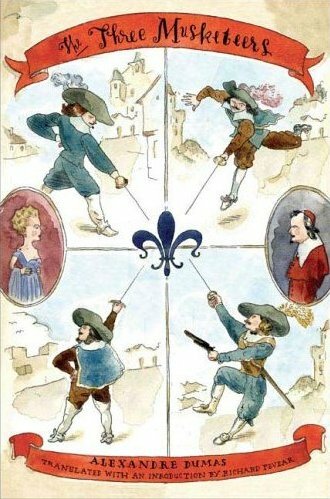 Although the US cover has more colour and recongnizable shapes, the title and subtitle treatment aren't prominent enough, and the eye doesn't travel well over the composition (where to go once you reache the fleur de lys? ).